Apple has just released download links of iOS 8 beta 5 for supported iPhone, iPad and iPod touch devices over on the iOS Dev Center. We’re now well and truly into the depths of iOS and Mac OS X beta region right now, with both iOS 8 and OS X 10.10 speeding towards a final, shipping product. It’s the mobile operating system that we’re interested in here though, with iOS 8 beta 5 now available to download if you’re a registered iOS developer. Two weeks after the fourth beta release arrived, iOS 8 beta 5 takes what has already been created and then builds on it, which is all that you can really ask for in an incremental beta release. We’ll be going through all the changes over the coming hours, whether they be new features or revisions of old ones, but with the final version expected to ship alongside the iPhone 6 in September, both Apple and third-party developers will be wanting to get as much testing done as they can. According to the change log that comes as part of the OTA update, there’s nothing much on offer, except for the usual ‘bug fixes’ and ‘improvements’. But in our books, that equates to new stuff, and we’ll surely dig it out in the hours to come. If you’re a registered Apple developer then you’ll already be well versed in how to get your hands on this fifth beta of iOS, so head on over to the Apple developer portal and get downloading right away. It might be worth having a flick through the always lengthy release notes while you’re there, too. 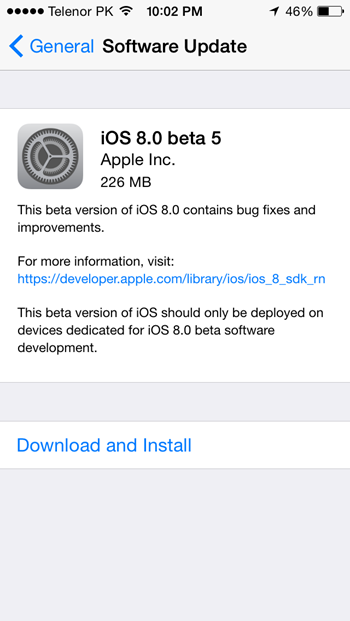 And if you already have iOS 8 beta 4 installed, then beta 5 can be downloaded as an OTA update, by simply heading to Settings > General > Software Update. 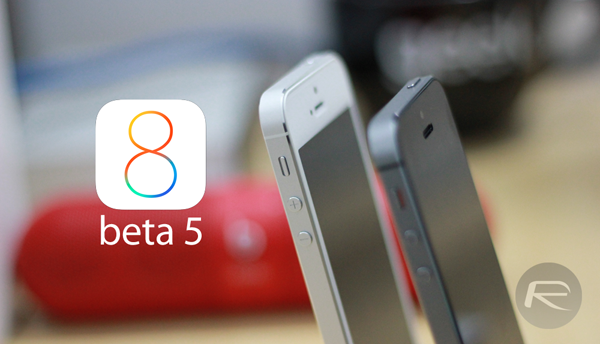 For everyone else, just rest safe in the knowledge that we’ll be putting iOS 8 beta 5 through its paces so that you don’t have to. Betas are no place for the general public to play, as many have found out in the past. App incompatibilities are commonplace with iOS betas, and there’s nobody who wants to find out that the one app they rely on won’t work following the installation of a beta release. We’ve all been there, and it’s just not pretty. Fear not though – September isn’t too far away. Photo editing on ipad 3 is mercifully faster in this beta. Still playing but that’s the first thing i tried. iCloud login via Settings not working: “An error occurred while trying to save your iCloud account”. So, let me get this right. This new beta takes what’s already been released… and BUILDS on it!? C’mon, that’s crazy talk! Next time, just right the article rather than throwing ridiculous arguments that make you sound like a 1st year English student. English 1-0-1. I believe you meant “write” not “right” right? English 1-0-1. I believe you mean “write” not “right” right? Keep trying. I logged out to confirm your finding and was able to log back in, but it did take about 30 sends to verify. If not try rebooting your device. iPad 3 here. Wow, you got me there. Thank goodness I don’t do this for a living! You can register it yourself for $99 with Apple.